Pine Tree Society PeerWorker, Annique Milite, is a 2013 graduate of Mount Holyoke College where she majored in Politics and minored in History. For three years after graduation she worked in transcription and also spent thirteen months as a phone surveyor for a market research firm in Portland. She also volunteered in Collections Management at Freeport Historical Society, assisted political campaigns and accrued a variety of professional skills. 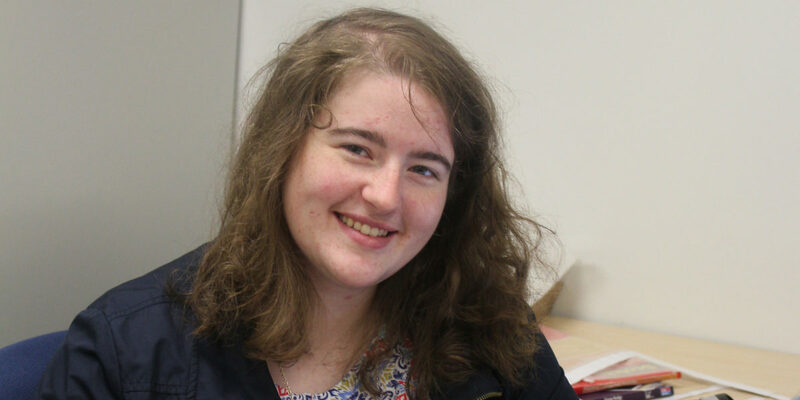 In addition to the PeerWork program, she is a Summer Intern at Cundy’s Harbor Library in Harpswell and a volunteer at the Maine Heritage Policy Center. Her interests include Politics and Current Events; History; Art History and Design; Classic, Foreign and Arthouse Cinema; Lapidary and Metalsmithing; Ornithology, Photography; Chess and Needlecrafts. Her ideal career would entail anything to do with History and Ideas, with other creative pursuits in tandem. “Thus far every expectation I had coming in has been met and exceeded. Right from the start Pine Tree takes you under their wing and treats you like an equal in the workplace and an equal to the tasks set before you. I’ve been involved in everything from printing labels and preparing mailings to making copies and laminates to streamlining files. And I greatly appreciate their attempts to accommodate each individual’s talents and desired areas of expansion. Regardless of my professional path, I already feel greater confidence towards pursuing the next steps and promoting my skill-set.